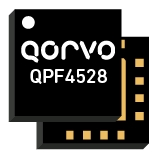 Qorvo has announced that its high efficiency 5GHz front end module (FEM) QPF4528 is part of a new, commercially available draft 802.11ax carrier gateway. The new gateway, which integrates Qualcomm Technologies IPQ807x family of 802.11ax chipsets, provides up to four times higher wireless networking throughput and better performance in bandwidth-intensive applications than previously deployed carrier gateways. The QPF4528 FEM – part of the company’s 802.11ax portfolio of high-performance 2.4GHz and 5GHz FEMs – transmits increased linear power without increasing power dissipation versus previous generations of FEMs. This reduces challenging thermal issues in the design of Wi-Fi equipment for multi-user multiple-input multiple-output (MU-MIMO) environments. The FEM’s power efficiency also enables applications that use Power over Ethernet (PoE), which is critical in regions of the world where output power is regulated. IHS Markit estimates that global 802.11ax-enabled device shipments will reach nearly 200 million units by 2021. Click here to learn more about the QPF4528 Front End Module.